The Oh My! Omaha Facebook community knows good food. 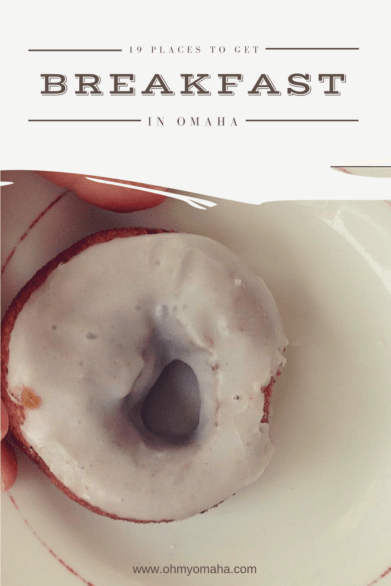 I recently asked where I could find the best breakfast in Omaha and they did not disappoint with recommendations. 11-Worth had a few votes for best breakfast. Jamie N. and Nicole B. both suggested it. The food is ample and the service is friendly, and as a bonus for kids, they get a balloon. 11-Worth Cafe, 2419 Leavenworth St.
Here’s a new diner (new to me, that is) that was suggested by Cee W.: AJ’s Café. Find AJ’s at 5146 N. 90th St.
Mishl P. recommended one of my go-to local restaurants for breakfast: Bailey’s. If you like benedicts, you’ll love the variety offered there. Bailey’s Breakfast & Lunch, 1259 S. 120th St.
UPDATE: The Diner’s original location has closed, but the restaurant has moved to be a part of Billy Frogg’s Grill & Bar in the Old Market. Gaby H. recommended this Old Market greasy spoon. Gaby actually recommended a couple, but The Diner is her first choice. The Diner/Billy Frogg’s Grill & Bar, 1120 Howard St.
Melissa F. recommended this popular restaurant, suggesting their cinnamon rolls and County Smoked Ham ‘n Eggs. This is a great place for a group. FarmHouse Café & Bakery, 3461 84th St.
Harold’s, a Florence staple, was recommended by Diane P. Ask for one of their homemade donuts to go with your meal. Harold’s Koffee House, 8327 N. 30th St.
Just off the main strip of Maple Street in Benson, you’ll find a little restaurant called Joe’s Café. Valerie L. recommends trying it out. Joe’s Café, 6564 Maple St.
Don M. recommended Keystone Café, one I’m not too familiar with. Keystone Café, 7805 Military Ave.
Leo’s Diner is a Benson neighborhood staple.Barb W. and Diane T. both recommended Leo’s. I love the breakfast there, maybe not so much the coffee… Leo’s Diner, 6055 Maple St.
Here’s a place you should probably expect a wait. It’s really good. Jennifer G. recommended Lisa’s, and she shared the stuffed french toast and an omelet (“fastastic!”). Violet M. suggested a dish I haven’t tried yet, but she may have convinced me to order it next time: “The butterscotch pancakes are AMAZING!! !” The decorations at Lisa’s are fun to look at, as well. Lisa’s Radial Café, 817 N. 40th St. It might not sound like a place for breakfast, but it is. Rebekah P. recommended Louie’s for breakfast. Louie M.’s Burger Lust, 1718 Vinton St. Ever heard of Nitehawkes Cafe? It’s the oldest restaurant in Omaha that serves breakfast. Read about it here! Over Easy is a favorite around these parts. Gaby H., Ashley P. and Erin F. recommended the cute little West O. restaurant, for breakfast. Order a homemade poptart to accompany your breakfast. You’re welcome. Over Easy, 16859 Q St. Looking for brunch? Mishl P. said Pitch (the West O. location) has a great brunch. “Fabulous bloody Mary’s and creme brûlée French toast and sausage ragout.” Pitch Pizzeria West Omaha, 17808 Burke St.
Melissa N. and Jen S. both recommended a restaurant in Bellevue, Neb., that’s a new one to me. She said try the chicken fried steak or french toast at The Special Restaurant. The Special Restaurant, 303 Fort Crook Rd. N., Bellevue, Neb. Tim T. suggested Summer Kitchen, particularly the potato casseroles. Summer Kitchen Café has three locations: 1203 Cornhusker Road, Bellevue, Neb. ; 12010 Giles Road, LaVista, Neb. ; and 1130 Sterling Ridge Drive. Reader Alisha L. recommended the brunch at Taxi’s. I haven’t dined there for any meal, so I think I’ll make their brunch my first meal there. Taxi’s Grille & Bar, 1822 N. 120th St.
Elise H. recommended the One Pacific Place location (there are a couple other locations). I’ve never been disappointed at Wheatfields – their coffee is great and their menu is extensive. Nicole B. recommended Wheatfields, as well, but didn’t single out which location. Don’t miss out on trying a baked good! Wheatfields, 1224 S. 103rd St. There are several chain restaurants in Omaha that have great service and food. Here are some that were recommended by readers: The Egg and I, Le Peep, and one of my favorites, First Watch. Have little ones? Check out this list of kid-friendly restaurants with a great breakfast! Get more posts like this delivered straight to your inbox twice a month. Subscribe to the FREE e-newsletter here. I’d say you could add The Downtown Coffee Shop and B&B Classic Dogs! 1.Petrow’s! Not only is their down home traditional breakfast goodies tasty; but they have a very fancy European Coffee Machine (I asked) that produces barista-quality drinks. 2.The Fair Deal Cafe has a FABULOUS brunch on weekends that is to-die-for! Be sure to go hungry!! I’m adding both of these places on my list to try. I’ve only been to Petrow’s for dinner. Thanks for the suggestions! Another great breakfast place is Shirley’s Diner in Millard. Ultimate comfort food place! I haven’t been to Shirely’s in years but I do recall it was tasty comfort food! Shirley’s Diner is another great breakfast spot located in Millllard! The new location also has a dinner menu now! Did they move to a bigger location? I somewhat recall seeing a sign in the same plaza but a different building. Is that right? New favorite Mar Cafe 46 & Dodge. Great Mexican food! Really? That’s not far from me. I’ll have to check it out. The Diner isn’t permanently closed! They moved in with billy frogs right around the corner! Really? That’s good news. I must have missed that announcement. Thanks for the heads up – I’ll look into it and update the post.